If there’s one crop that sums up the sheer joy and plenty of growing your own, it’s the humble bean. Most beans are very quick growing and, once they get going, you can expect week after week (after week!) of tender, tasty pods. We’re going to look at two types of bean: bush beans, and climbing pole types. So let’s get started! Bush beans are very quick growing and may be sown every three or four weeks from spring to give a succession of pickings throughout summer. They’re handy for filling in any gaps and perfect for tubs and window boxes. Pole or climbing beans need a little more space and some form of support to help them climb, but on the flip side you’ll get many more beans from each plant. They’re a great way to add height to the vegetable garden and can make an attractive feature. Beans can be further categorized by their pods. Green beans generally have smooth, slender pods. Depending on where you live, you’ll also know them as string beans, snap beans or French beans. 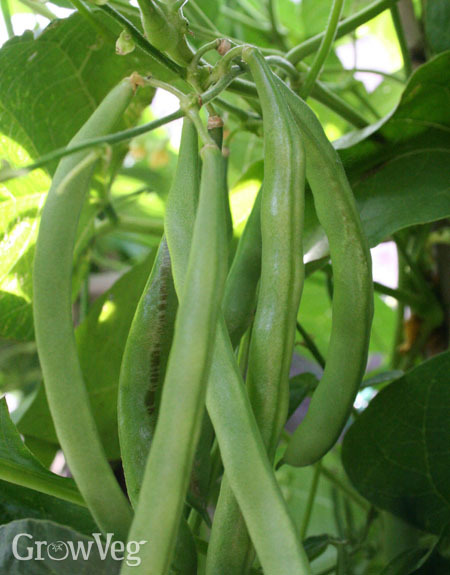 Runner beans tend to have slightly coarser pods and continue cropping a few weeks later than string beans. Then there are the beans exclusive to warmer climates including soya beans, lima beans, and the appropriately named yard-long beans! All beans prefer a sunny spot in well-drained soil that was improved with compost or well-rotted manure the autumn before sowing. A clever technique to boost growth is to create a compost trench. Dig out a trench about a foot (30cm) deep where your beans are to grow. Fill it up with kitchen scraps and spent crops, top with leaves then cap it off with soil. By spring the ground will be beautifully rich and moisture-retentive, and your beans will thrive in it. Sow beans where they are to grow, against their supports or, for bush types, four to six inches (10-15cm) apart with 18 inches (45cm) left between each row. Use a hoe to scratch out rows or dig individual planting holes with a trowel. Drop in two seeds per hole, so they fall about an inch (2cm) apart, and are two inches (5cm) deep. Make the first sowing one week before your last expected frost date, then continue sowing every three or four weeks until midsummer. Thin each pair of seedlings to leave the strongest. Or sow in a greenhouse or cold frame for the earliest start – up to a month before your last frost date. This will also help protect young seedlings from slugs and snails. Use deep plug trays or pots so there’s enough room for the roots, and sow into any general-purpose or seed-starting mix. You can get away with sowing one seed per module or pot; but sow a few extras just in case! Beans don’t tolerate frost. Transplant them outside only when you’re sure there’s no chance of a late frost. Harden seedlings off a week beforehand by leaving them outside for a few hours, increasing the time gradually each day. A shaded cold frame is great for acclimatizing plants. Space bush bean plants at the same distances as used for sowing. Carefully ease them from their plugs or pots, then lay them out where they are to be planted. Use a trowel to dig a hole, drop the plant into place then fill in around it and firm into position. Plant pole beans at least six inches (15cm) apart, with rows around two feet (60cm) apart. The traditional way to grow beans is against parallel rows of bamboo canes, joined where they cross at the top to a horizontal cane. Or try a bean frame. Instead of leaning into each other, the canes lean out and are secured to a rectangular frame at the top. It’s a simple take on the usual ridge-supported setup, and by having the canes leaning away from the center like this the beans hang to the outside, so they’re a lot easier to pick. But it’s bean teepees that are arguably the prettiest support option. Take the opportunity to create a centerpiece to your garden – a vertical leafy accent brimming with blooms and beans! Seedlings may sometimes need a little encouragement to latch on to their supports, but they’ll quickly find their own way up. Bush types rarely need much support, though top-heavy plants, laden with beans, will appreciate short canes, twigs or peasticks to keep them off the ground. Keep your beans well watered in dry weather, especially once they begin to flower. Mulching around the base of the plants helps to keep the ground moist for longer, and it gives weeds a tougher time. Any weeds that do peek through should be removed by hand to avoid disturbing the bean plant’s roots. Pinch out the tops of pole beans once they’ve reached the top of their supports. This prevents them from becoming an ungainly tangled mass, and it concentrates the plants’ efforts into producing more flowers and beans. Once your beans are ready, it’s essential to remember the three Ps: pick, pick…and pick some more! When they’re in full flow beans are almost unstoppable, but only if those precious pods are picked as they appear, while they’re still relatively young and slender. At this point they’ll be nice and tender, but leave them too long and they’ll turn stringy and tough. Stop picking, and production will grind to a halt. Towards the end of the season it’s worth leaving a few pods of open-pollinated or heirloom varieties to dry out on the plant. Shell the dried pods then bring the beans inside to dry further in an airy location. Store the beans in paper envelopes, labeled with the variety and date, then use them for next year’s crop. Check out our article on growing beans for drying if you’d prefer to dry beans for eating.